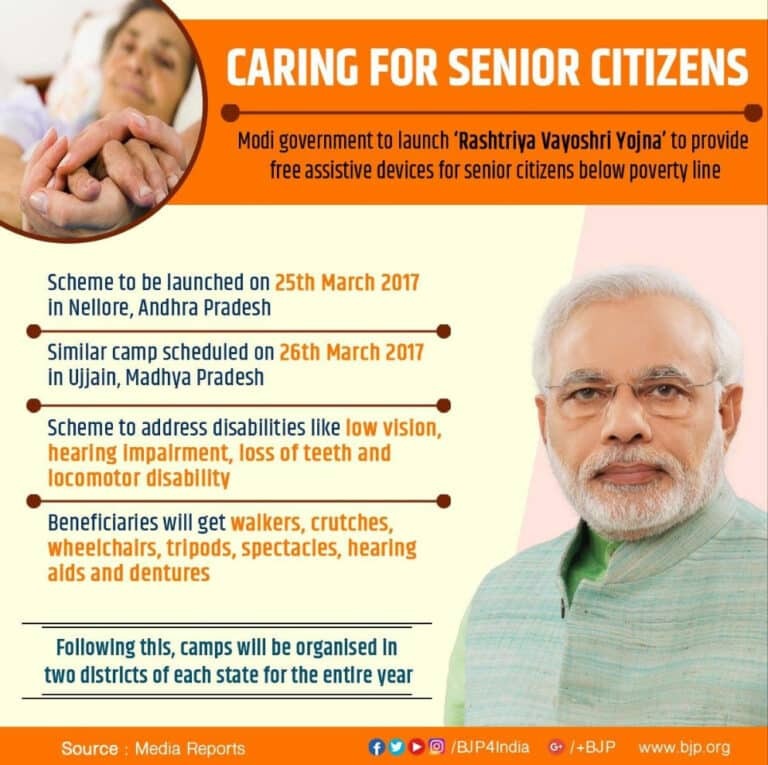 Rashtriya Vayoshri Yojana is a new upcoming scheme of Narendra Modi Government in 2017 for senior citizens living below the poverty line. Under the new scheme the central government would offer free living assistive devices to senior citizens belong to BPL families to make their lives easy. The scheme would be implemented at a cost of Rs. 477 Crore and will be launched on 25th March at a camp in Andhra Pradesh’s Nellore district. Under the scheme, the central government would provide free assistive devices like hearing aids, wheelchairs and many more among all. The main objective of the Rashtriya Vayoshri Yojana is to enable older people from economically backward society live an active life and create an aged-friendly society. The scheme is aimed at providing them life assisting devices so that they can maintain near normalcy in morbidity. 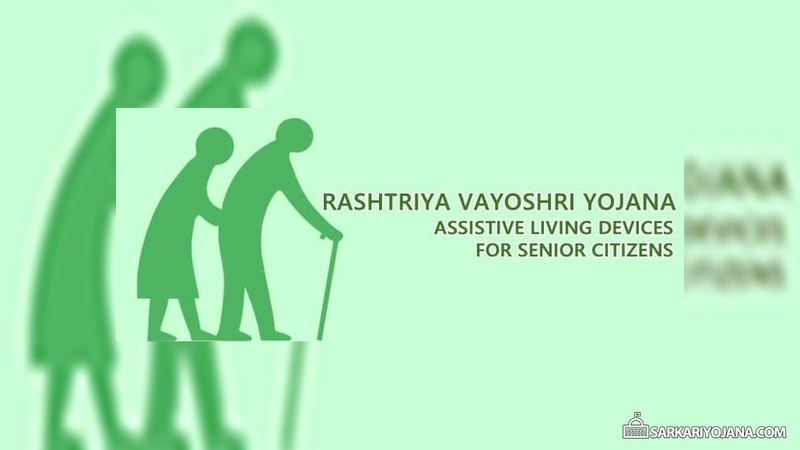 Old age disabilities like low vision, hearing impairment, loss of teeth and locomotor disability would be addressed through the Rashtriya Vayoshri Yojana. The central government has set a target of distributing free assistive devices to at least 2000 beneficiaries in each camp. For distributing the devices, the government would organize camps in two districts of each state for the whole year. The government has state governments to identify beneficiaries for the scheme. First two camps would be organized in two districts of Andra Pradesh, as below. Below is the major list of devices to be distributed under Rashtriya Vayoshri Yojana. The complete list of devices would be available only after the scheme is launched. The devices to be distributed under the scheme would be of high quality and conform to the standards laid down by the BIS (Bureau of Indian Standards). As per the SECC-2011 data, there are about 10.38 crore senior citizens in the country out of which 5.2% (About 54 Lakh) of them suffer from some sort of old age-related disability. The number of senior citizens is expected to reach 173 million (17.3 Crore) by the year 2026. Increase Traffic Fines by 10% Every Year – Revised Motor Vehicle Bill by Central Govt. Atal Bhoojal Yojana – Water Conservation Scheme to be Launched by Central Govt. Condonation of Delay Scheme 2018 for Disqualified Directors by Central Govt. do you have any information on saving scheme for Senior Citizen//8%//10 Years//7.5 Lacs..
Thankful to you for your great help for old age persons through this scheme all. I also congratulate to you for your great thinking for all. In this scheme i remember your slogan “SABAKA SATHA AND SABAKA BIKASH.